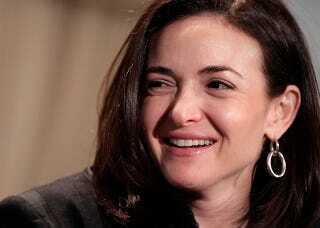 Facebook's Top Female Exec & "Girl Questions"
After a talk Facebook's chief operating officer Sheryl Sandberg gave at Harvard Business School, she saw a difference between the women and the men. The men asked about business; the women asked "girl questions." Sandberg's characterization is found in a significant New Yorker profile this week, which says it is also about Silicon Valley's "male dominated culture," but is more clearly about questions about women's leadership in elite circles generally. What is a girl question? The only example given is "how to find a mentor" (and then after the talk itself, maternity leave) and when pressed by fellow female executives, Sandberg backs off from her criticism. It's a telling moment, and a contradictory one. By every account, Sandberg actively tries to help women, explicitly, as a mentor, and her career owes a lot to her own mentor, Larry Summers. But writer Ken Auletta also zeroes in on something that other profiles of Sandberg, her much-viewed TEDTalk and her recent speech at Barnard only hinted at: Sandberg's particular philosophy of power and why women don't have more of it. Which is to say, why she's less interested in structural analysis of gender inequality and more in telling women to get off their asses. Sandberg's own personal solution involves women changing their own behaviors — being more assertive, more fearless—as well as personally creating networking and community-building opportunities for women coming up the ranks. It seems to go back to her Harvard days, when she co-founded a group called Women in Economics and Government. Auletta says, "Nonetheless, Sandberg claims that she was not a feminist. The goal of the group, she says, was just 'to get more women to major in government and economics.'" Question: Was she a feminist when she realized, upon college graduation, that she felt like a fraud, unlike her male classmates, or "that women, unlike men, encountered tradeoffs between success and likability," or when she worked harder than her peers at the World Bank, or when she encouraged women to take a seat at the main table at work, literally, or when she was mildly dismayed to hear her young son say she wasn't welcome in his Star Wars dreams because "I've already invited my sister, and there's only one girl in space"? Unclear. Auletta also interviewed Marie Wilson, the founder of the White House Project, who says, "Underneath Sheryl's assessment is the belief that this is a meritocracy. It's not...Women are not dropping out to have a child. They're dropping out because they have no opportunity." All of which gets to a key reason why Sandberg might see the world the way she does — a meritocracy where women need to step up to the plate and stop asking "girl questions," as if ignoring mentorship and maternity leave will make the issues themselves go away. It's something that's not in the piece, perhaps because it's so "regular" as to be invisible: Her class and her race. The piece mentions that Sandberg "has a nanny at home and a staff at work. Google made her very rich; Facebook may make her a billionaire," but the key variables begin far before Sandberg made her own money. The piece reports that Sandberg was raised by an ex-French professor stay-at-home mom and an opthamologist dad, graduated at the top of the economics department at Harvard. She is also white, conventionally attractive, and socially graceful. (I say this as someone with relatively similar privileges). That doesn't mean that her success is any less impressive or that Sandberg needs to apologize — among other reasons, she's doing plenty with her power to advance other women — or that lack of representation at the highest echelons isn't an important feminist cause. (If we needed a measure of the fact that gender matters, factoring out class and education variables is one way.) Even women who will never set foot in Harvard Business School (or don't care to) are better off if there are more Sheryl Sandbergs at the top, for the same reason we need The New Yorker, with its massive reach beyond people who already care about this stuff, and Racialicious to tackle ladybusiness in their own ways. To be lasting and effective, change has to happen on as many levels as possible, and our current organization is such that money and power are prerequisites for certain kinds of progress. (Recent example: Gay marriage didn't pass in New York until conservative billionaires wanted it to.) But it also has to include the notion that a belief in meritocracy only makes sense if the system already pretty much works for you, even if incompletely.